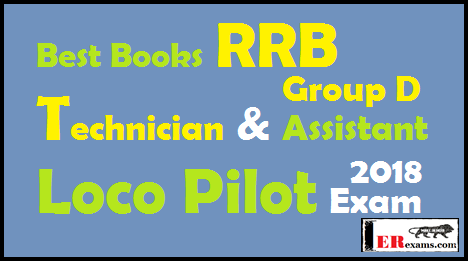 Best Books RRB Technician and Assistant Loco Pilot RRB group D Exam 2018. Best and useful Hindi and English books RRB Technician And Assistant Loco Pilot (ALP) and RRB group D Exam 2018. As we know RRB Exam 2018 require various posts of Assistant Loco Pilot 17673 and Technicians 8829 also RRB Group D (62907 Post). these book help you crack your exam in one attempt. In RRB exam 2018 the candidate needs to secure a minimum score of 42 marks in each of the test batteries to qualify. In Basic Science and Engineering covered under this shall be Engineering Drawing, Basic Electricity, Levers and Simple Machines topics. Below table provide you some best books for Basic Science and Engineering and Trade related exams best books. Non-technical section CBT will consist of Basic Science and Engineering Mathematics, General Awareness, General Intelligence & Reasoning, General awareness on current affairs. I have provide you some best books for this exam. I hope this post will help your RRB Technician and Assistant Loco Pilot Exam 2018. In future I will update more books for this exam. If you like this post please share with your all friends.